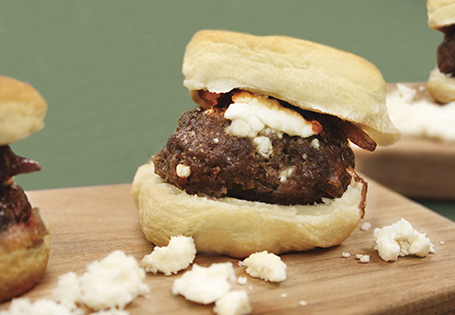 Mini beef burgers topped with feta cheese and a tangy sauce. In a large bowl, combine ground beef, salt, pepper and crushed red pepper. Cover with plastic wrap, refrigerate. In a medium saucepan over medium heat, heat the oil. Add onions and garlic. Sauté until onions are soft and translucent, about 10 minutes. Add the maple syrup, wine and brown sugar. Reduce heat to low, cover and simmer 30 minutes. Season to taste with salt and pepper, remove from heat. On a baking sheet, form beef mixture into 24 patties. Bake 5-10 minutes. Place the rolls on a separate baking sheet. Brush tops with melted butter and bake until golden brown, approximately 8-10 minutes. Top patties with cheese and broil 3-5 minutes. Place on rolls, top with onion jam and serve.